It’s no secret that Louisville is home to some pretty great restaurants. Some are inexpensive like El Taco Luchador and others, like Jack Fry’s, are visits you really need to save for. The city offers a diverse range of cuisine, yet there is one type of food service that is often overlooked: food trucks. Though sometimes hard to find, if you’re in the right place, you can discover some delicious eats. One of the best of these mobile eateries in Louisville is called La Chandeleur. 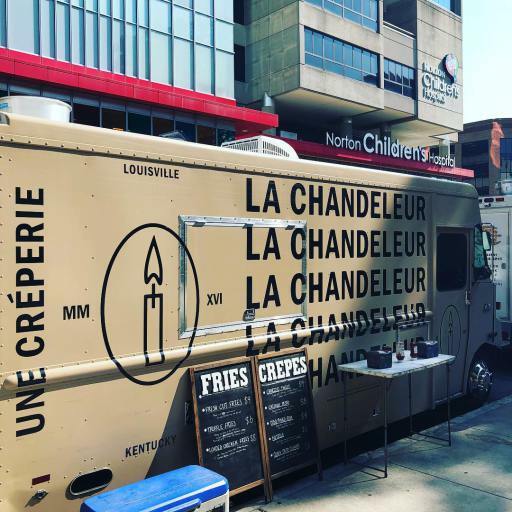 La Chandeleur is one of Louisville’s newer food trucks having only been operating for two years. In that time, it has created a huge following and has even been nominated for Louisville Magazine’s Best Food Truck award. What makes La Chandeleur so special? First and foremost is the food. Chef and owner Kyle Thomas specializes in French crêpes with a twist. After spending time in France with his wife several years ago, he was inspired by French cuisine. Today, the truck serves mostly savory crêpes such as the Chorizo Twist (chorizo, pork, cheese, bourbon mustard, a chipotle aioli, AND the tastiest pickles of all time) and the Chicken Pesto (chicken, spinach, in a creamy pesto sauce). Thomas also serves up his own take on another familiar favorite: fries. Hand cut daily, La Chandeleur’s fries are always fresh. You can get regular fries, truffle fries and loaded chicken fries–all of which are incredible. The truck also just introduced vegan chicken nuggets made from jackfruit. Another awesome aspect about La Chandeleur is that almost everything made on the truck is either prepared fresh or locally sourced. All of those tasty crêpes and delicious fries are made to order right on the truck. Thomas also uses things like BBQ sauce and pickles from local vendors. Even his eggs come from the chickens owned by a family friend. It’s easy to connect Kentucky cooking with foods like pulled pork BBQ, biscuits and fried chicken. Louisville especially boasts some great, yet typical places to grab a meal (I’m looking at you Feast and Grind). If you’re looking for something different and delicious look no further than La Chandeleur food truck. Thomas posts almost daily where he’s stationed for the day. You can check him out on Instagram at @la_chandeleur or on FaceBook at La Chandeleur Food Truck.